Roses are blooms of love, and this stunning red rose bouquet is classically arranged to ensure your love is expressed in a fine, time-honored style. 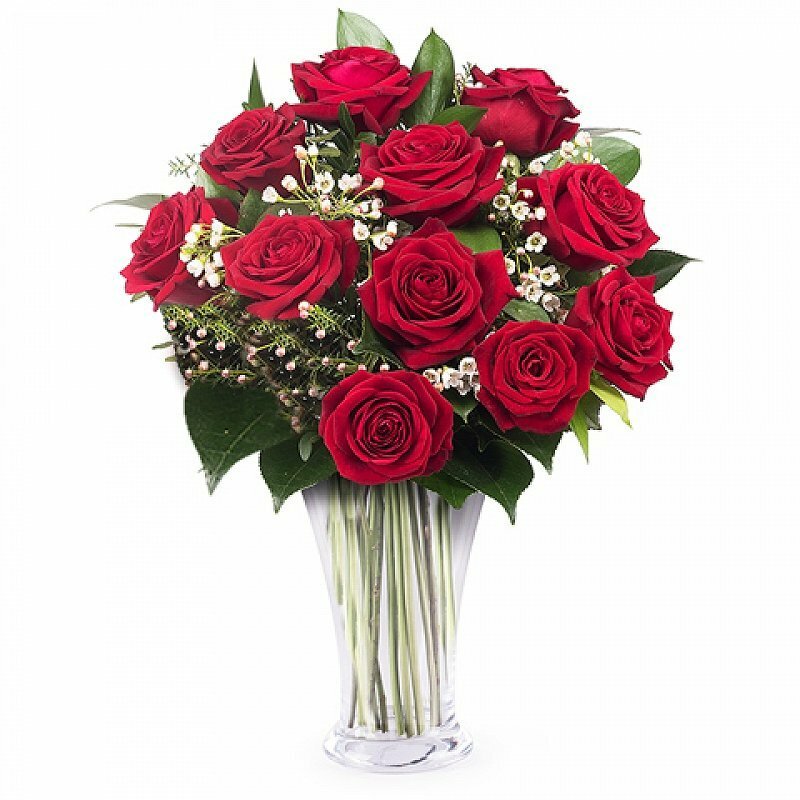 More about this bouquet: This bouquet features 11 red roses, touched up with attractive greenery. Send your thoughts and best wishes to someone in need with our get well flowers. If you know someone who´s been taken ill or who is on the mend get well flowers are a great choice that will lift their spirits and help with the healing process. International flower delivery of these bouquets is ideal for anyone facing an upcoming operation or a few difficult months. Flowers have the one-of-a-kind ability fill any room with life and vibrancy. Whether one wishes to brighten up a hospital environment or to bring a splash of colour to a home, these get well bouquets are the ideal option to help your loved one feel better. And with our modern and reliable delivery service to over 90 countries, you can count on FloraQueen to make sure you get the message across to the person in their time of need. Even better, these arrangements are perfect for both men and women alike, and they will invigorate a friend or loved one of any age. The touch of life that flowers bring is probably one of the best ways to help someone to "get well soon". The gift of flowers is unique, they are unlike anything else. One of the best ways to let someone know you care and to show them that you are there for them. Thanks to reliable delivery service, FloraQueen offers these arrangements to national and international destinations with same day delivery available. Helping you to send well wishes and thoughts for a speedy recovery to those who need it most. It can be difficult to know that a loved family member or friend is sick or undergoing a difficult time in their life. We want nothing more than to be with them and to comfort them. Sadly, though we know that this is not always a possibility. When you are not able to be there in person to comfort the ones you love FloraQueen has the perfect solution. Send them one of our carefully selected get well bouquets. These vibrant bouquets will show them you love them and miss them as well as bring a much-needed smile to their face. Adding colour and life to their home or room, letting them know that you are there for them and that you care, even from afar. When words are not enough a gift can say it all. With our network of the best local florists from around the world, FloraQueen is a go-to florist for international flower and gift delivery. We even offer same day flower delivery, so if something bad happens, you can show them straight away that you are there for them. We are your go-to international florist. For a little something extra, send along a plush teddy bear or a something sweet with your dearest sentiments for them. This will surely let them know just how much you care about them during their time of need. Using FloraQueen's international flower delivery service is the perfect way to let someone know you’re thinking of them. Deliver them a get well soon message today!